Why not choose some vintage style wedding invites like these Passport Wedding Invitations and matching evening invites designed to look like vintage Luggage Tags if you're looking to add some nostalgic flair to your celebrations. Linzi and Matt were getting married at the beautiful Elsham Hall in North Lincolnshire when they contacted me about stationery for their big day. Not only were they looking for a Passport style wedding invite (which is, of course, my speciality) they also needed matching invites for their evening reception. The beautiful venue was partly the inspiration for their invitations as was their love of travel. Originally from the UK, they were currently living in New Zealand and with a traditional English country wedding felt the travel theme alongside a vintage style would suit them to a tee! We started work on the Passport design incorporating elements from my Tuscany style passport. Linzi also loved the idea of a birdcage on the front with a pair of Love Birds inside. The finished design looked elegantly charming with the vintage style they were looking for. Next came the matching evening invites. I suggested Luggage Tags for these as they would, not only, compliment the travel theme but also work out to be quite cost effective, especially when ordered with another item of stationery. Like these Vintage Style Wedding Invites? 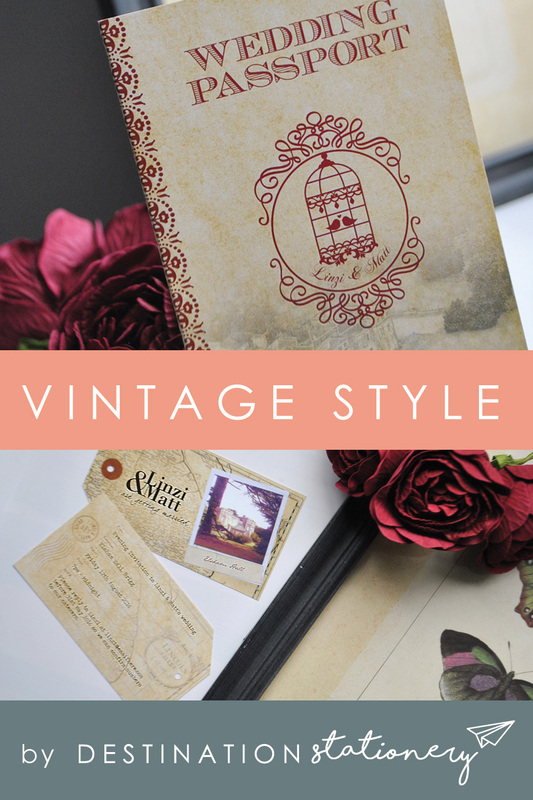 Click the boxes below if you'd like to see a sample of this style or get a quote for your own vintage style wedding invites and stationery.